NOTE: For objects that are related to the firewall itself, such as interfaces, make sure to use the objects from the cluster when creating the rules. The cluster objects will automatically get translated to the correct object for the individual cluster members. The next step is to compile and install the rules on our servers. 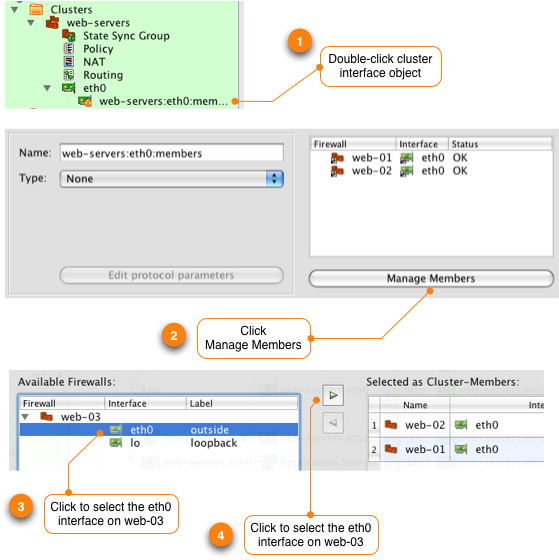 When Firewall Builder compiles the cluster it will generate a firewall script for each of the cluster members including substituting the cluster objects used in the rules for the matching local object on the cluster member. For example, the IP address for the eth0 cluster object is automatically translated to the correct address for web-01 (192.0.2.11) and web-02 (192.0.2.12). You can see this substitution by inspecting the generated file for web-01 after the compile is completed. Note that the destination in the rule shown below is set to the IP address of web-01's eth0 interface. 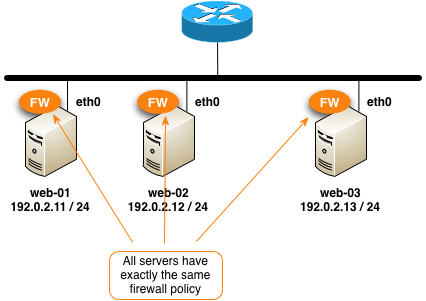 Now that you have a cluster setup to generate firewall policies for each of the server firewalls it is easy to make changes that affect all your servers. For example, to add a new rule to all members of the web-servers cluster to allow ICMP from the Trusted Networks object to servers simply add the rule in the cluster policy and compile and install it to the members. To add a new server to the cluster you first need to create the firewall object to represent the server. You can do this manually, or you can follow the same duplication process we used to create the web-02 firewall object. The next step is to add the new web-03 firewall object to the cluster. To deploy the firewall policy on web-03 you need to compile and install the cluster policy. Since the cluster policy hasn't changed we don't need to re-install the policy on web-01 or web-02 so we unselect them from the install list. You can add and remove servers to the cluster as needed. Here's our configuration now that we have three servers in the cluster all running the same firewall rules.